While the Rangers are taking a long break, all of our eyes are on Jeff Gorton and what comes of the Rangers in the weeks leading up to the trade deadline. We know there will be trades. But what isn’t known is which bodies will take over once those trades are made. It’s a fair assumption that there will be players from Hartford on their way to the Big Apple at some point in February and March. Since we here at BSB aren’t really able to catch Pack games, I reached out to Ricky Milliner. Ricky is a season ticket holder and blogger for the Pack. He’s a great follow on Twitter if you’re looking for real time updates on the Pack. I had a bunch of questions, and Ricky was very helpful and incredibly detailed in his replies. He was so detailed that I actually decided to split this into two posts. Expect the second half later this week. 1. The Pack have had a rough year, but have there been any standout players that folks should be looking to for positives? RM: There are a few players that has stand out in Hartford. Peter Holland is the most noticeable on the ice out of anyone. His experience as a veteran has helped Hartford tremendously on the offensive aspect of the game. He has scored in games to keep Hartford ahead or in close proximately of games they are down in. As the season progressed, he has become the juggernaut of producing points and is in the top 10 players with points in the AHL. That’s impressive, considering he is playing with a young roster. The prospects have benefitted from the forward as he sets up plays, plus giving the perfect pass to prospects to capitalize on opportunities. Looking in the standpoint for New York, he would be a good veteran to call up if there are injuries. He has definitely earned himself a potential look. However, with the youth movement going in on the organization, he may be stuck in Hartford taking on the leadership role. Dustin Tokarski and Marek Mazanec are also positives on the group. Both veterans has bailed out the Pack numerous times. If both goalies were not playing up to par, Hartford would be in a deeper hole in the Atlantic Division. Despite being low in the standings, Hartford is close enough to stay in contention for moving upwards as a few points separate them and the mid to top tier teams. The issue with this season is the weak defense. Both veterans in net have stopped pucks from going in the net as they faced many chances (constant breakaways, short-handed chances, and odd man rushes). The defense often gets exposed, but that is expected as the blue line is a young group. Tokarski and Mazanec must be given credit this season as they had tough duties in net. Looking ahead, I expect one of them to leave considering the Rangers having a good amount of goalie prospects. One beneficial veteran goalie helps in Hartford since they are capable to mentor the young, inexperienced prospect. Ville Meskanen is another bright spot on the Wolf Pack’s roster. The first year rookie is consistent, considering the adjustments to North American ice and the professional life. If he does not produce points, he performs the defensive duties well. He is able to pick away pucks and transition the group from defense to offense. He does tasks that are considered small, but are big to help the group overall perform in games. 2. How have the “big name” prospects (Lindgren, Hajek, Andersson) looked? There’s more to a performance than a stat line, especially on a relatively poor team. RM: The development aspect of the league is exciting to see. Lias Andersson has worked on his overall game than just offensive. Last season in Hartford, the talented prospect has produced good numbers. Looking at this season, he has done similarly. I have noticed he is working on his defensive aspect of his game. He is attempting to branch out and build upon his assets in the neutral zone, utilizing his reach and plus speed. There is more to look at than points. Is he ready for New York? I will say not yet as his defensive aspect of the game is the weakest. 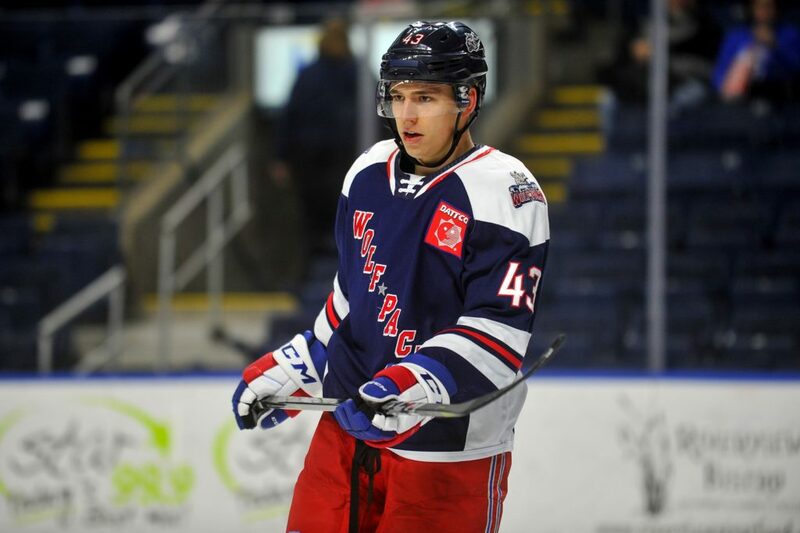 We need to be patient to ensure he is as successful as Filip Chytil. I can see him getting a call up late this season or make the Rangers next year. He has shown strides in offensive chances, but defensively he needs to show more. He is attempting to find his game in both ends of the ice. I am confident he will be a great player in the future with New York. He plays consistent nightly. Libor Hajek’s first full season in the AHL is off to a good start, development wise. Despite offensive struggles, the prospect has grown greatly from the October to now. Head coach Keith McCambridge realizes his potential and has given him larger roles on the team as the season continued. Hajek’s attitude is tremendous considering the lack of experience in the professional ranks. He comes in practice with the right mindset and is willing to learn from anyone that helps him. When he has events happen to him such as giving up the puck from a turnover, or not doing enough to prevent a goal against, he held his head high and focuses on the remainder of the game. Night in and out he continues to held his game to a high standard. He is one of the stronger players on the team that is consistent. His mental game is fantastic for such a young player. Often times the transition from juniors to pros is tough on a player. Ranger fans will enjoy his play once he becomes ready for the big club. Ryan Lindgren is another fun prospect to watch. He is able to move the puck well and does play with his body. He needs to work on his offensive game, but will come to him eventually. Defensively he is able to block shots and works hard. He provides a good mix of assets that is useful for his development and New York. 3. Ty Ronning was a player I had as a potential sleeper, but he couldn’t stick at the AHL level. What was the issue? Do you think he has a shot? RM: Ty Ronning’s situation was disappointing for my end. I expected him to stick in the AHL with Hartford, based from past brief stints with the group towards the tail end of the last two seasons. He has shown potential and I thought he was ready to make the jump. As we fast forward to this season, his playing style was different. As he became frustrated with the adjustments and not being able to pull off what he wanted to do, his attitude got in the way of development. The young forward was not a team player and tried to become the all-star of the team. His puck possession and way he played was a lone wolf mentality, without playing with his line mates. He did not last long with Hartford as McCambridge and Chris Drury noticed his change in play. He was given a little time to adjust. Add in his mentality, attitude and struggles, the organization felt Ronning was not the guy to be in Hartford. The forward brought his game in Maine, but was not given any opportunities to redeem himself in Hartford. As I follow the Mariners periodically, I noticed he was often injured. Those injuries have set him back to earn a call up back to Hartford. As a result, other players from Maine have been in Hartford to brief stints. It’s too early to assume the future with Ty Ronning. If he wants to be a Ranger, he has to earn it. He has to step it up and be ready to play in the competitive AHL. I believe he has potential in his development and I refuse to write him off. The question now is when he will be ready for Hartford. He has a shot with the Wolf Pack if he’s healthy and has performed consistent with a better attitude. "Wolf Pack Q&A With Ricky Milliner (Part 1)", 4 out of 5 based on 7 ratings. When Peter Holland is the first name mentioned as far as “standouts” are concerned, then that tells you all you need to know about our Hartford prospects. I like Lindgren a lot, but I was very disappointed that he was called up before Hajek, for sure. Yeah, the commentary here is certainly appreciated…but definitely not what I wanted to hear. You don’t want to hear that a replacement-level-at-best 28 YO forward and two goalies who have no future in the organization (barring major unforeseen circumstances) are the brightest spots. As for Andersson…am I mis-remembering, or is he pretty much turning out the opposite of the narrative at the time he was drafted, concerning his play style? I thought he was supposedly very close to ready defensively/two-way but would need to expand his offensive toolkit to find his NHL place…no? Am I completely getting that backwards from what it was somehow? Furthermore, I am not advocating for no focus on defensive effort among the forward group when I say this, but…I’m beginning to suspect the whole organization is just a bit too concerned with it. We’ve heard it referenced in recent years regarding Buch being stapled to the fourth line for chunks of time. There was concern Chytil could handle that end of the ice well given his build and inexperience on NA ice. Obviously Hayes was never allowed to spread his wings from the get-go offensively as his scouting reports would have suggested should happen, and was forced into a two-way role (which he has handled just fine, thankfully, but that doesn’t mean it didn’t stunt his natural offensive tools). Miller was punished at times for defensive mistakes that seemed a bit ticky-tack to focus on. Etc. Now it sounds to be the biggest concern for Andersson, yet frankly, that wasn’t the biggest issue I saw in his NHL time to date, at all. I get wanting responsible forwards…but this level of focus seems to be getting out of hand. They can’t all be Jesper Fast – nor should you want them to be, frankly. Hajek might carry his head high, but he’s still making a ton of mistakes early in games. Day needs work keeping his feet moving when getting back in transition, it seems like when he gets close to closing someone out at the blue line he doesn’t commit. First of all, thanks to you and Ricky for this interview – quite informative. I have two thoughts. The fact that the defense is bad is somewhat disturbing. Half the team defense consists of guys with NHL experience, who should be at least decent AHLers — and the other half are touted prospects (except Crawley) who should not be overmatched. With players like Hajek, Lindgren, O’Gara, Bigras, Gilmour, one would hope that the defense would be a strength. Having Peter Holland in Hartford and Cody McLeod in NY may be best for the development of our young prospects as Holland can be a role model. And it hardly matters in NY as the Rangers are going nowhere. BUT, if David Quinn honestly thinks McLeod is a better player than Holland, that is disturbing and suggests DQ should not be the coach long term. Yeah, what we know is that Gorton brought McLeod back, then added McQuaid, and now Quinn seems more than happy to keep throwing minutes at the both of them. If I was Quinn, I’d not be pleased with those two even being on the roster – let alone giving them minutes. Really starting to think they believe these guys are the better players. Really starting to get depressed about the future when I think about that, haha. They’re not trying to win: they’re trying to instill the level of compete the coach wants while learning Quinn’s system. The D routinely gets killed on royal road passes, which is usually on the C being out of position, but Hajek gets nutmegged a lot. It totally scares me that the defense in Hartford is that poor. We have NOBODY to call up that could help us defensively. Any trade we make needs to bring back a stud defenseman. We might as well let the kids play in the big leagues as our NHL defense can’t get too much worse. Scary that Holland is the only prospect considered NHL ready. We are 4 years away. Being flexible and expansion draft proof is always where they should be pointing towards. The shift of Seattle’s entry has complicated things, but nothing that isn’t fixable. Thanks for sharing the report and the insight. Defense is a 5 skater responsibility and in the AHL you don’t see many forwards on the backcheck…the rotation of lineups doesn’t help…and I’m not reading too much into the +/- of Hajek and others when you read the TOI and situations that they are playing them in. Lindgren is not a surprise on getting the call up…stays with his man doesn’t chase. IMHO too many Rangers fans expect overnight NHL ready out of a prospect…Lias as an example…some of this is Ranger fans who have been spoiled with contending success since the lockout…blame the wrong guys if any for not winning a Cup in that stretch of 2012 to 2016…but then again many Ranger fans have never paid attention to Hartford or prospect development before…and many fans don’t realize how many 1st and 2nd round picks were traded to get guys at the deadline in those contending years. I wish the AHL would lower the cost of streaming…just a thought as instead of bitching and complaining the fans should enjoy watching these kids come along. Ricky thanks so much for sharing your reviews and updates on Twitter !